Attorneys have an ethical obligation to communicate with a client about their representation. At Comrade Web Agency, we want your website communicates your message before your first conversation. The challenge is often communicating what you need to a client over a website can be a bit dicey as an attorney. Fortunately, we identified a few attorney website design secrets to improve communication and conversions with clients. Psychology is one of the most important aspects of website design. After all, you have less than 7 seconds before some visitors decide to bounce from your site. You need to make a great first impression. How do you keep them engaged? You need to know your audience. Do you work personal injury cases? You might want to use soothing blue colors to keep them a bit calmer after a recent accident. On the other hand, if you represent corporate customers you might want to incorporate some green in the website. This way, they know you will protect their money. Every website tells a story. Make sure you understand the psychological needs of your customer to ensure your client’s work with your company. Secret #2: Are you mobile? You might have noticed an abundance of Android and iPhone smartphone users. Whether you hate them or hold them like a blanket wherever you go for comfort, you must acknowledge the growth of mobile technology. To succeed on mobile, you need to create content and designs that work on a multitude of screens. As Louis Sullivan stated, “Form follows function.” The reference was towards skyscrapers. Yet, he would appreciate how this concept remains true in our mobile-obsessed world. 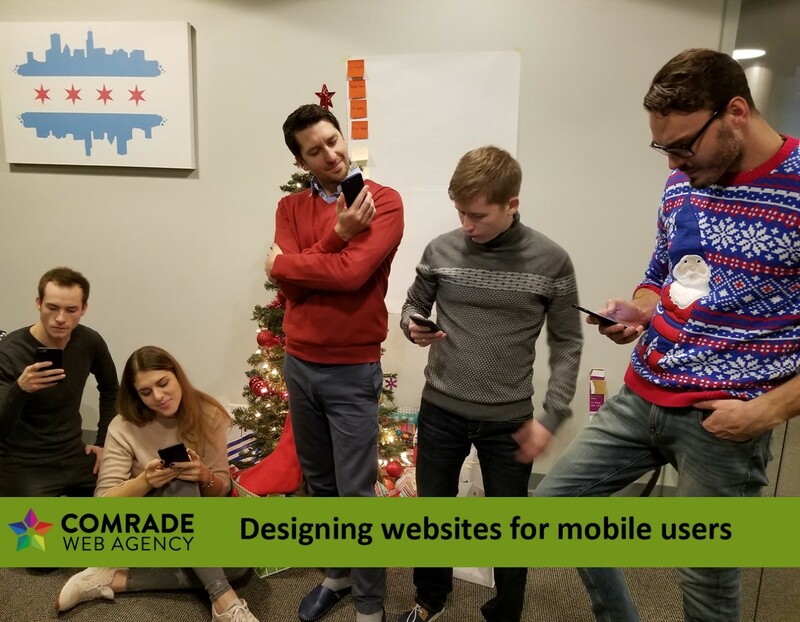 When you design your site to fit mobile devices, you communicate your message to all your potential and current clients. Unless you are the only attorney in your one-horse town, you need to stand out from your competition. If you use the same template your competitors use, you will get the same lousy results. Working with a web design agency utilizes multiple people with varying skill sets to help you get the best project for your business. Many attorneys don’t want to get pigeon holed into a specific area of law. The challenge is unless you are the largest law firm in your town or city, you need to have a niche. People want specific information. If you do everything, then your message is not specific to your client’s individual needs. Additionally, focusing on a practice area improves your lead generation efforts. It is easier for a residential buyers’ attorney to generate leads then an estate planning and real estate attorney. Besides, you do not have to turn down estate business when it comes your way. 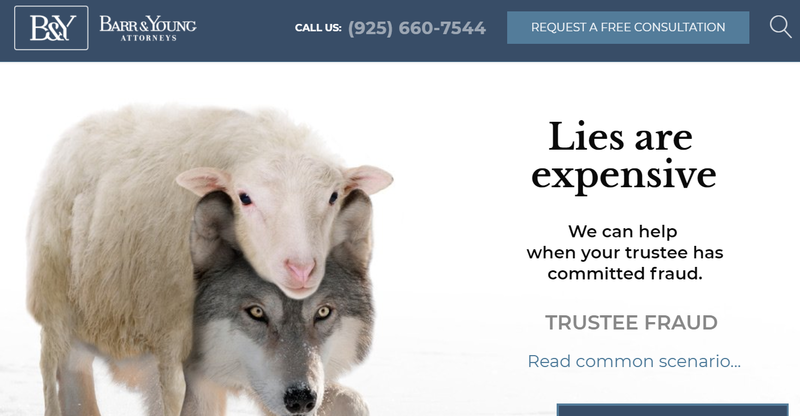 You have a million other attorney websites out there that all look like carbon copies of each other. They end up using the same stock photos with the same boring meetings with customers in the office. While you don’t want your attorney getting too creative, it is good to have an attorney who can show they are different from the herd. Take this Barr&Young image below how Lies are Expensive. We all heard about the wolf in sheep’s clothing before. However, this image makes it strikingly clear how things can go wrong with the wrong Trustee. Instead of bragging about how they are different, they show the visitor how they can help them with a clear visual. Websites do a lot of things for attorney websites. One of the biggest reasons attorneys have them is to bolster their image to potential customers. Therefore, you want your website to have trust indicators demonstrating how you can help your customers with their challenge. A great way to do that is by providing case studies from past clients you helped. Obviously, keep their information private, and ask for permission before talking about their case. Another thing you can do is bring up reviews you received on sites like Avvo, Google, and FindLaw. The key is that users can easily find your information as well as the reviews. Plus, since many of these reviews use names and details of the case, you are not revealing any private information by sharing their testimonial on your site. Google and Avvo even have options to embed those reviews directly on your website. Communication matters when you work with a customer. It also matters when you craft a message about your firm on your website. The design is part of that communication. If you want to improve your message, then let a professional web agency like Comrade Web Agency help you. Our experienced team is ready to help you enhance your attorney website design today. Contact us to schedule a free initial consultation.